I have seen a lot lately about the LUSH Ban the bead campaign. It surrounds the concept of the environmental damage that microbeads in exfoliants are having on marine life. In one study 35% of fish tested were found to have microbead particles in their digestive system. Microbeads in body and face exfoliants are made from plastics (you will see it on packaging as Polypropylene or similar) that do not bio-degrade and are therefore building up in the oceans. There are 2 types of exfoliaters 1: Chemical ( such as a sallysidic acid) or mechanical (beads/grains/particles). I think that it is pretty unnecessary to use an artificial product on your skin when there are so many natural grainy substances that can do the same physical job. So in the name of beauty I set about to make my own natural exfoliants using only ingredients from my kitchen or garden. I have a pretty normal skin type, and generally only exfoliate my face once a week, but I stopped altogether for about 5 weeks. By this week it looked dull and lifeless! This is a great deep cleansing exfoliate that can be left on as a mask. Charcoal is deeply purifying and detoxing for the skin. 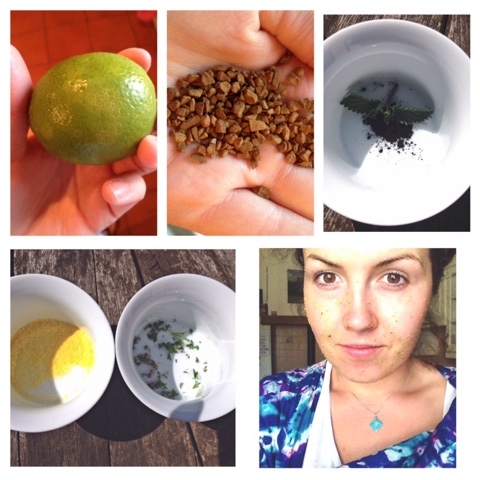 The lime is packed with Vit C and Mint contains Vitamin A which helps repair skins surface. Empty the charcoal capsule and mix all the ingredients into a bowl, use your fingers to mash everything up into a paste. The charcoal is a fine powder so it is the perfect light exfoliant for oilier skin. Mix all the ingredients in a bowl. Polenta is a fine maize grain rich in Vit A and C. It is slightly coarser so perfect for drier skin. Corriander is very nourishing for dry skin too. A small drop of coconut oil to bind it all together. My skin was so soft after using this.